Free PMI-ACP Exam Practice Questions, Study Tips, Training and Courseware. We Provide Real World Agile Training, Specifically for Software Development Projects. Al Smith, Jr. PMI-ACP, Lean/6 Sigma Black Belt, CRISC, SCJP, CFT. In addition to being an instructor, Al is a highly experienced IT professional with REAL WORLD experience developing and supporting successful projects for companies such as a GE Healthcare as a Sr. SOA Engineer, Costco Wholesale as an Enterprise Architect consultant, CalAmp as a Director of Engineering and providing Java/JEE consulting for the Office of Naval Research, SPAWAR and General Dynamics. He is consistently recognized for using Lean, Agile and Six Sigma to improve IT organizations effectiveness and efficiency. Having served in the US Army, Al is comfortable with being a compassionate leader while maintaining uncompromising standards of performance. By leveraging skills as an Agile/Lean/Six Sigma Black Belt he has the experience necessary to execute on value-driven initiatives while driving quality, optimizing value streams and mentoring high performance teams to increase the bottom line. Vanina Mangano PMP, PMI-RMP, PMI-SP, ITIL, Project+, is a subject matter expert in project management, risk management, and strategic management. Over the past ten years, Vanina has worked with several global technology companies as a senior contributor and leader and is currently overseeing a project management office (PMO) at Microsoft. As part of her contributions to the community, Vanina volunteers through PMI, currently serving as a core committee member of the PMBOK Guide, 5th edition update project. Vanina holds a dual bachelors degree from the University of California, Riverside, is a certified Project Management Professional (PMP), PMI Risk Management Professional (PMI-RMP), PMI Scheduling Professional (PMI-SP), and CompTIA Project+. She is the author of the PMP: Project Management Professional Exam Review Guide, PMI Risk Management Professional Exam Study Guide, and other project management related books and articles. Seriously, Who Has Time to Read All these Book? We did! 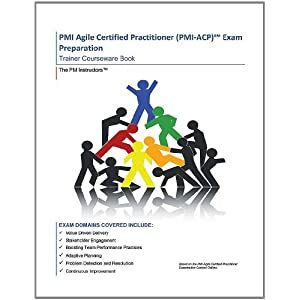 And we guarantee you’ll pass the PMI ACP Agile Certification Exam on your first try if you learn the concepts provided in our collection of practice questions, study material and courseware. Our free PMI-ACP Training site is designed to get you started in the right direction as to where you should focus your study efforts, and exactly what you need to know to pass the exam. When we began studying for the exam we purchased all 11 books, and later realized we only needed 4 of them. That isn’t to say that the other 7 books weren’t of any value. They were—but reading the same thing 7 different ways was really a waste of time. All the same, when you have access to good material you don’t need to take 100’s of practice questions to gage how much you know. Either you know the Agile concepts or you don’t. Like Agile, we believe that “Less Is More!” Once you learn the core values and principles behind being Agile the other books simply reinforce the concepts through various perspectives and scenarios. So in the spirit of operating Lean and removing waste we’ve distilled the contents of all the recommended books into one source our:PMI Agile Certified Practitioner (PMI-ACP) Exam Preparation Self-Study Courseware. Unlike the other PMI exams, the questions on the PMI-ACP exam aren’t as abstract. However, if you’re able to understand the abstraction of Agile that ties all of the tools and techniques together you’ll easily be able to pass the exam by focusing on the main tenants of Agile. So when you study smarter, instead of harder, you don’t need to waste your time reading all of the recommended books or taking “hundreds” of practice questions. GET YOUR 21 PMI-ACP PDU's NOW! Another unique aspect about this courseware is that it’s written by an experienced Lean IT Enterprise Architect and certified PMI project manager. As founders of “The PM Instructors”, we’ve leveraged our skills as technical trainers and REAL WORLD IT professionals to ensure this courseware offers an in-depth look at Agile project management from both a PMI and software development perspective--delivered in a combination of lecture and hands-on learning format. This unique combination allowed us to write the material from each of our perspectives. As a result, it will help project managers and developers that use this material to learn how to communicate and collaborate with each other more effectively—long after you’ve passed your exam.